Guides that will send you packing. ï¿½As the train – began its downward rush towards the Swiss lowlands I saw the Alps – there swept over me a thrill of pure excitement and amazement such as comes to a human being only once or twice in a lifetime. Fortunate are those who gain the vision of the mountains at an early age, and splendid their adventure. The Alps offer almost unlimited adventure, and the Walker's Haute Route is probably the single finest way of accessing these mountains and experiencing the adventures to be had there. Trekking from Mont Blanc to the Matterhorn, from Chamonix to Zermatt, the Route traverses one of the best stretches of the Pennine Alps – the mountain range in the western part of the Alps that stretches between Valais in Switzerland and Piedmont and the Aosta Valley in Italy. Negotiating 11 ridges over 180km and taking 13 days to complete, the trek is not for the faint-hearted. However, it isn't technically demanding and for those with the stamina and stomach for it, the rewards are immense. More than two centuries ago, when Paccard and Balmat forged their way to the top of Mont Blanc for the first time and Whymper won the race to be first to stand on the summit of the Matterhorn, few could have realized the effect these achievements would have. In the wake of these bold, audacious pioneers came first a few tourists, and then many, many more. Nowadays the slopes of both Mont Blanc and the Matterhorn are thick with climbers and trekkers; there's a cable car three-quarters of the way up Mont Blanc. Huts support the hundreds of people who struggle to the summit every year. Apparently benign and serene, yet still claiming dozens of lives every year, the mountains have borne witness to the whole spectrum of Alpine history. Once the abode of dragons and the redoubt of monsters, they have become a challenge to mountaineers and walkers alike. Upon reaching the summit of the Matterhorn for the first time, Whymper recorded in his book – the delightful, unassumingly titled Scrambles Amongst the Alps – that, ‘We remained on the summit for one hour, ‘One crowded hour of glorious life’. It passed away too quickly, and we began to prepare for the descent. 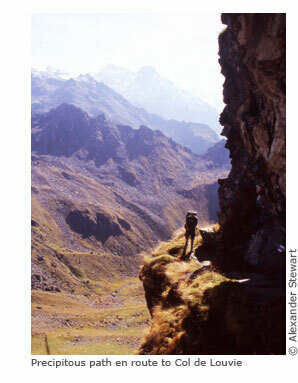 Traditionally the classic Haute Route was done as a high-glacier traverse. The Walker's Haute Route is different in that it follows paths historically used to move between valleys and uses non-glaciated passes to cross from one valley to the next. It boasts unlimited moments of wonder and awe, though, that linger and remain with you long after the day has passed. Travelling across the grain of the land means that there are repeated ascents and descents through a wide variety of scenery and terrain. From every high point there are immediate, unparalleled views of giant peaks clustered together, whilst in every valley there are hidden secrets and a very traditional, Alpine way of life. Despite all the attention and interest, the peaks remain unsullied, their wilderness virtually undiminished. In his Ode to Mont Blanc Percy Bysshe Shelley wrote of the ‘giant brood of pines’ swaddling the mountain's flank before describing how, mesmerized, he watched rainbows stretch across waterfalls and listened to the noise of the River Arve and the eagles soaring above. Two centuries on the landscape has changed little and although there are more people searching for that ‘crowded hour of glorious life’ as described by Whymper, it doesn't take much effort to discover that, as Shelley noted, the Alps remain ‘remote, serene and inaccessible’, a place where silence, seclusion and wilderness are still a very real possibility.